The DAX index made a sharp decline of 0.94% to end at 11850. While US-China trade optimism fades, President Trump’s threats of tariffs on the EU leveraged attention on Tuesday and dampened global sentiment just as IMF downgraded its global growth forecast from 3.5% to 3.3%. Today, the ECB is expected to keep interest rates steady given the disappointing data out of Germany and the EU since the central bank had decided to take policy measures to stimulate the economy. However, the monetary policy statement will be of interest as markets seek further elaborations on the regions slowing economy against geopolitical risks which may weigh on the DAX Index. 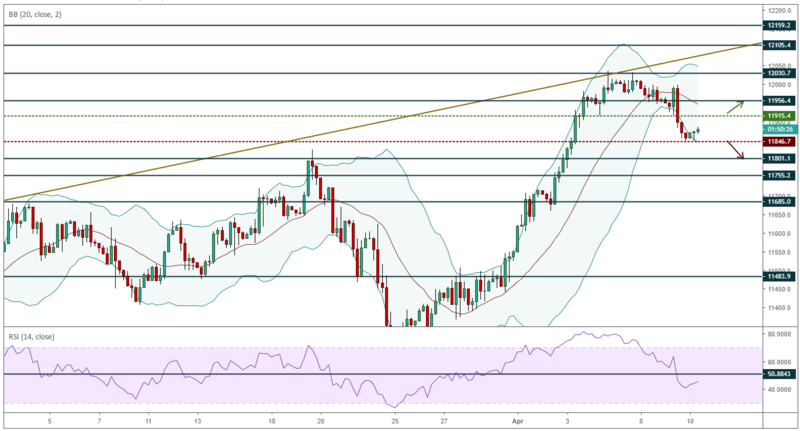 The DAX index continued to decline on Tuesday as price traded through support at 11910 and ended at 11850 as the RSI fell below the 50-midline to enter negative territory. Should the RSI reading maintain below 50 and price holds below the 11910 level, there’s a good chance of seeing the price moving towards lower support targets at 11790 and 11760 following a break through 11850. However should the 11850 level hold as support, a break through 11915 will be required to indicate any upside move.